We don't know who her parents were or what became of them, and she may have been an orphan. Gertrude was raised in the Benedictine abbey of Saint Mary of Helfta, Eisleben, Saxony from age five. An extremely bright and dedicated student, she excelled in literature and philosophy, and when she was old enough, became a Benedictine nun. At age 26, when she had become too enamored of philosophy, she received a vision of Christ who reproached her; from then on she studied the Bible and the works of the Church Fathers. Gertrude received other visions and mystical instruction, which formed the basis of her writings. She helped spread devotion to the Sacred Heart of Jesus. Her writings have been greatly praised by Saint Teresa and Saint Francis de Sales, and continue in print today. Born to a wealthy and pious family, the son of Reinald and Mabel Rich; his father retired to become a monk, his two sisters became nuns. Studied at Oxford, England, and Paris, France. At Oxford he received a vision of the Child Christ. Priest. Professor of art, mathematics, philosophy and theology at Oxford. Known for his scholarship, piety, and skill as a preacher and writer. Canon of Salisbury, England in 1222. Preached the Sixth Crusade in England in 1227. Consecrated Archbishop of Canterbury, England on 2 April 1234. Advisor to King Henry III. Presided over Henry's ratification of the Magna Carta in 1237. Assisted in his public dealings by Saint Richard of Chichester. Prevented civil war in Wales. His support for monastic discipline put him in conflict with his own order, King Henry III, and the papal legate. He died while on a trip to Rome to gain the support of the Pope. Granddaughter of King Edmund Ironside of England. Great-niece of Saint Stephen of Hungary. Born in Hungary while her family was in exile due to the Danish invasion of England, she still spent much of her youth in the British Isles. While fleeing the invading army of William the Conqueror in 1066, her family's ship wrecked on the Scottish coast. They were assisted by King Malcolm III Canmore of Scotland, whom Margaret married in 1070. Queen of Scotland. They had eight children including Saint Maud, wife of Henry I, and Saint David of Scotland. Margaret founded abbeys and used her position to work for justice and improved conditions for the poor. Daughter of Count Favorino Scifi and Blessed Hortulana, she was raised in a series of castles in and around Assisi, Italy. Younger sister of Saint Clare of Assisi, and her first follower, leaving home two weeks after Clare to join the Benedictines at San Angelo di Panzo at age fifteen. The family tried to bring Agnes back by force, dragging her from the monastery, but her body became so heavy that several knights could not budge her. Her uncle Monaldo tried to beat her, but was temporarily paralyzed. The family then left Agnes and Clare in peace. In 1221 a group of Benedictine nuns in Monticelli asked to become Poor Clares, and Saint Francis assigned Agnes as their abbess. 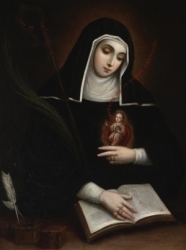 Agnes wrote about how much she missed Clare and the other nuns at San Damiano, and after establishing other Poor Clare monasteries in northern Italy, Agnes was recalled in 1253 when Clare was dying. Agnes followed Clare in death three months later. Educated in the ancient provice Rhaetia, an area in modern Switzerland and Germany. Priest. Presided over a church of Saint Florinus in Rhaetia, probably the same church where Saint Florinus worked and was buried. Appointed abbot at Saint Gall, Switzerland in 720, and united the area monks into a monastery under the rule of Saint Columban. As abbot, he added a hospital and school, and changed the monastery's rule to Benedictine. Legend says that when Othmar fed the poor from a barrel of provisions, it never became empty, no matter how much he took from it. In 759, Counts Warin and Ruodhart unjustly tried to gain possession of property belonging to the abbey. Othmar resisted, they imprisoned him at the castle of Bodmann, then on the island of Werd-on-the-Rhine where he died. His cultus spread soon after his death, and he is now one of the most popular saints in Switzerland. Bishop. Nothing else is known about him for certain; various writers have made him a descendant of the 3rd century Cynedda Wledig, King of Britain, a cousin of 6th century Saint David of Wales, and the 10th century bishop Jeuan who was killed by Viking invaders, but no one today knows for sure. The church dedicated to him at Lanafan Fawr, Powys, Wales was apparently a site of pilgrimages in times past, and site of at least one miracle. The English Lord Philip de Braose came to the area to hunt, and decided that the church was the best lodging for him and his dogs. When he woke at sunrise, his dogs had gone mad and he was blind. His sight was only restored by making his willingness to fight in the Crusades. Son of Thomas Osbaldeston. Studied at the English College in Douai, France, and then at the seminary in Rheims, France. Ordained on 21 September 1585. On 27 April 1589 he returned to England to minister to covert Catholics. Had a great devotion to Saint Jerome. Betrayed by Thomas Clark, an apostate priest, he was arrested at an inn in Tollerton, Yorkshire on 30 September 1594. Tried for high treason by reason of being a priest, he was quicklly condemned. Martyr. Fourth abbot of the abbey of Cava dei Tirreni in Campania, Italy. Elected in 1124, he served for 16 years of great political turmoil between state and Church; his rule was noted for his concern for the local laity under the abbey's protection, and for the works of the monks he sent out to reform other houses. Held in high esteem and sought out consellor by bishops, fuedal lords, King Roger II, Pope Anacletus II and Pope Innocent II. Studied in Vienna, Austria, and ordained in Munich, Germany on 21 June 1936 as a priest for the diocese of Lezhë, Albania. Arrested in Shijak, Albania in February 1945 for remaining Catholic following the Communist take over. Sentenced to prison where he was eventually murdered. Martyr. Born to the nobility, well educated, and known for his learning and as a gifted speaker. Married to Galla, who became a nun in later life; father of at least two sons – Saint Veranus of Vence and Saint Salonius of Geneva. In 422 he became a monk at Lérins, France, and Galla became a nun. Wrote works on asceticism. Reluctant bishop of Lyons, France in 434. Presided over the Council of Orange in 441. Worked with Saint Hilary of Arles. Fifth century bishop of Asti, Italy. Little information and survived, and historians don't agree on any of it. Father of Saint Ludre. Imperial Roman senator in Déols, Gaul (in modern France). A pagan, he converted to Christianity in the early 4th century, brought to the faith by Saint Ursinus of Bourges, brought in missionaries to his area, supported Ursinus, and converted his own house into a church for their use. Breton monk. Priest. Bishop of Vannes, France. At age 87, he retired from his see to live his remaining days as a hermit. Known for healing by prayer. Feast permitted by a 1679 decree of the Sacred Congregation of Rites for all provinces of Spain, in memory of the victories obtained there over infidels. Pope Benedict XIII granted it to the Papal States and it may now be celebrated with due permission by churches throughout the world. Benedictine monk of Abingdon Abbey, England. Abbot of Abingdon. Bishop of Wilton, England. Archbishop of Canterbury, England in 995. It was during his governance that Kent was invaded by Danes. Third bishop of Padua, Italy, serving from 166 to 168. Son of Saint Leocadio of Déols. A convert, he died almost immediately after baptism, still wearing the white robes. Official in the court of Emperor Constantius. He was demoted from the court by Julian the Apostate. Martyr. Seventh century bishop of Comminges, France. Raised in a pagan family. Convert, baptized at Bordeaux, France where she became an evangelist. A group of North African Christians murdered together for their faith, date unknown. We know little more than their names - Baricus, Donatus, Honoratus, Januarius, Justus, Markus, Paulus, Rufinus, Valerius, Victor and Vitalis. 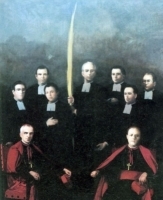 Soon after the start of the Spanish Civil War in 1936, the Communist-oriented Popular Front had all clergy and religious arrested and abused as they considered staunch Christians to be enemies of the revolution. Many of these prisoners were executed for having promoted the faith, and this memorial remembers several of them killed in the province of Almeria.